The student-built Fathom II rocket launched from Spaceport America on March 4, 2017, reaching an altitude of 144,000 feet. A student-built rocket soared to an altitude of 144,000 feet (44,000 meters) on March 4, setting a record for a launch vehicle created entirely by students. The Fathom II rocket was designed and manufactured by students at the University of Southern California (USC) Rocket Propulsion Laboratory (RPL). Fathom II blasted off from Spaceport America in New Mexico, going as fast as four times the speed of sound, according to a statement from USC. The university captured the record-breaking launch on video, including footage from a camera on board the rocket during the flight. The student-run undergraduate group has been working on the Fathom II rocket for about three months. Leading up to the launch, the students tested the avionics communication and recovery systems, as well as the launchpad setup (the rocket shattered the pad's cinder blocks during launch). After the successful launch, Fathom II came down under a parachute and was recovered intact 6.8 miles (11 kilometers) from the launchpad, according to the statement. "The goal of this mission was to qualify and test our systems before moving on to our next space shot," Carter Allen, chief engineer of the Rocket Propulsion Laboratory, said in the statement. "You know what that means? Time to move on to space." The spacecraft's record-setting altitude of 144,000 feet is about three times the average cruising altitude of most commercial airliners, the statement said. That makes this the most successful launch in the lab's history, shattering the records of other campus-based rocket clubs, including Delft Aerospace Rocket Engineering (an amateur rocket club consisting entirely of bachelors and masters degree students)at 70,397 feet (21,000 m), and the German University of Stuttgart HyEnD team, at 98,400 feet (30,000 m), according to the statement. 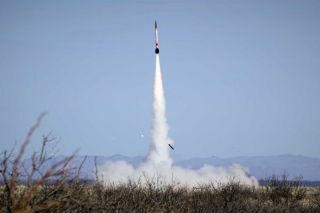 "While other university groups have reached higher altitudes using mixtures of professionally made and student-made components, the new record from the USC Rocket Propulsion Lab (RPL) is believed to be the highest altitude achieved worldwide for a vehicle designed and manufactured entirely by students," the statement said.